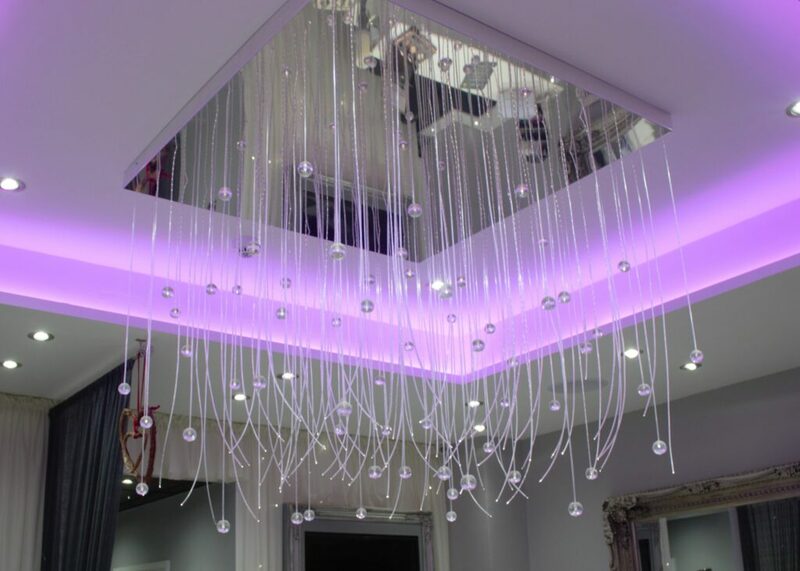 We were approached by a client who was refurbishing an old dated office into a beauty salon and they asked us for some ideas to add some feature lighting. The client already had plans to have a suspended ceiling with a recess feature so we agreed RGB LEDs would look great to up light the ceiling. We recommended a chandelier for the centre of the recess and agreed on a design using a 1000x1000mm mirror base with 150 drops and randomly placed crystals powered by a 150w halogen light source. In the treatment rooms where the lights are usually dimmed we thought the clients would love a starry ceiling to look up at while they unwind. We turned a conventional suspended grid ceiling into a beautiful modern twinkling starry ceiling. The salon and our work was featured in the Accent Magazine, which we’re very proud of. If you’re in Gosforth you should pop into the salon for a look, the staff are brilliant and would love to show you around, the atmosphere is amazing, the decoration is gorgeous and you could treat yourself to some well deserved pampering.